Ischgl, once a farming village, is one of Austria’s top ski resorts, located below one of Austria’s greatest and highest ski areas, and in the most snow reliable western corner of Tyrol – the Paznaun Valley. The main ski resort is located between 2,000 m and 2,872 m altitude and has one of the longest winter seasons in Austria, starting from the end of November until early May, offering great enjoyment for skiers and snowboarders of all ages and skills and breathtaking scenery. The skiers and snowboarders can choose from 238 km of perfectly groomed slopes and pistes, served by more than 40 high-tech lifts, connecting Ischgl to the Swiss duty-free zone, Samnaun and forming the Silvretta Arena, one of Austria’s largest and charming ski areas. Most of the lifts are ultra-fast, heated and have windshields as well. The main way to reach the mountain is by the three gondolas: the Fimbabahn, the Pardatschgratbahn and the Silvretta gondola, each taking 2800 people per hour safely up to the centre of the skiing – the Idalp, ideal for every skier and snowboarder, from experts to beginners. Ischgl is famous for its traditional ski school, the Schneesport-Akademie, which has at least 100 very well qualified and trained ski and snowboard instructors that not only can teach how to ski but can also provide information about the weather or the best places for skiing. Each ski season begins and ends with the famous “Top of the Mountain” festival held at the Idalp, one of the biggest reasons for the resort’s increasing international popularity. Some of the most famous artists such as Robbie Williams, Bon Jovi, Elton John, Rihanna and many others have been part of the festival, attracting, even more, visitors each year. Apart from the “Top of the Mountain” festival, other events also take place in Ischgl, such as the Ischgl Snow Sculpting Competition, a very popular event held each year when some of the most renowned artists use their creativity to make spectacular sculptures from snow; or the Frejins Snowboard Freeride Inferno sports event. The resort has an excellent après-ski atmosphere and dynamic nightlife throughout the winter months. Partying and socializing is possible at a number of bars and discotheques, which become lively as soon as the lifts close. The bars, restaurants and shopping boutiques are as good as in any big city. Other evening activities include tobogganing, bowling, swimming, as well as film and theatre shows. In summer, the amazing mountains in the Silvretta Arena are excellent for the hiking and mountain biking enthusiasts, offering over 1,000 km of hiking routes. Top-class mountain bikes events are held in Ischgl, such as the Ischgl Ironbike race, attracting some of the best mountain bikers. The accommodation in Ischgl is of a very high standard and for every budget. Visitors can choose from typical Austrian hotels, chalets, B&B or private apartments with self-catering, some of which are located at a walking distance from the gondolas. The easiest and fastest way to reach Ischgl is by travelling from Innsbruck Airport, located about 100km and about an hour and a half drive from the resort. Other alternatives are Munich Airport, located about 229km; Zurich Airport, located about 234km or Salzburg Airport located about 279km from Ischgl. 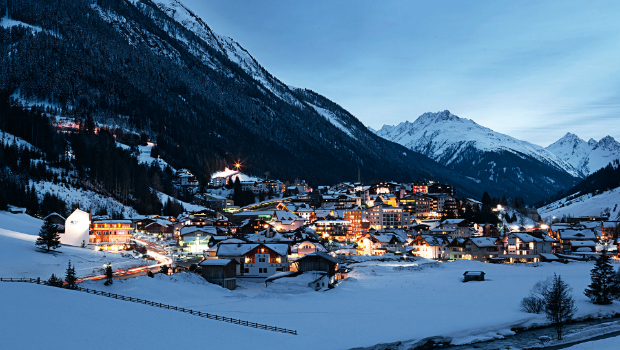 Getting from Innsbruck airport to Ischgl will require arranging airport transfer. There are several transportation options from Innsbruck airport: public transport, airport taxi, car rental and private airport transfer. You can take a bus or train and travel through the beautiful mountain landscape. At the airport, you can find car rental companies if this is your preferred option or take an airport taxi. In order to save time and have a stress-free journey from Innsbruck airport to Ischgl, you can arrange your airport transfer in advance by making an online reservation with one of the Innsbruck airport transfer providers. You will be provided with door-to-door service, which is especially convenient for ski transfers to Ischgl as you carry larger luggage including ski equipment. The fixed price for taxi transfer per vehicle is another advantage, especially if you’re a larger group, as the cost for airport transfer to Ischgl is significantly lower. The taxi driver will be waiting for you at the airport holding a sign with your name and any delays will not affect your transfer time, as the flight monitoring service is included in the price.